Last week, Evan Grant reported the not-surprising news that Jason Botts and Nelson Cruz were essentially fighting for one roster spot. Who’s more likely to win? Cruz has the defensive advantage, to be sure, though Botts can narrow that advantage if he proves capable of handling first base this spring. Also, for the first time in a while, Texas appears to have above-average outfield defense. With Josh Hamilton, Marlon Byrd, David Murphy, and (eventually) Milton Bradley roaming the field, the need for another plus glove isn’t quite the high priority of previous years. Both Botts and Cruz fared well in winter ball. Unfortunately, both Liga Dominicana and Liga Mexicana del Pacifico play roughly equivalent to AAA, which is to say their exploits were par for the course. With neither having established himself, the battle may come down to which player shows more in 50-or-so Spring Training at-bats. For a couple of reasons, that’s virtually a dice roll. Also, especially in early March, Spring Training features a wider variety of competition than any regular-season league. You may see in a few weeks that Botts has outplayed Cruz statistically, but you might not know that Cruz faced Joe Saunders twice while Botts teed off against Joey Jo-Jo Shabadoo. Back in my ESPN days, I pleaded with people to ignore spring stats, which are worthless in terms of predicting regular-season performance. Remember when Matt Kata batted .375 last spring, then had about 140 consecutive hitless at-bats when the games counted? Good times. So, spring stats are nearly meaningless… unless you have two guys fighting for one job. Then they’re all-important. These are the results of binomial probability distributions. The “true�? 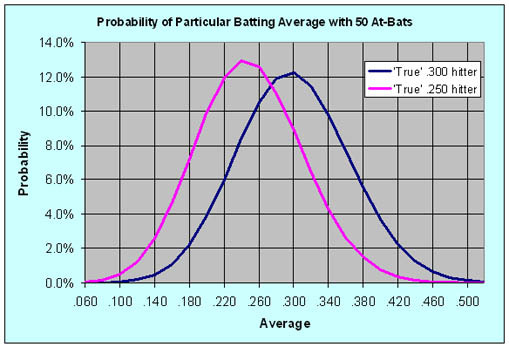 .300 hitter has a 30% chance of getting a hit in any particular at-bat. 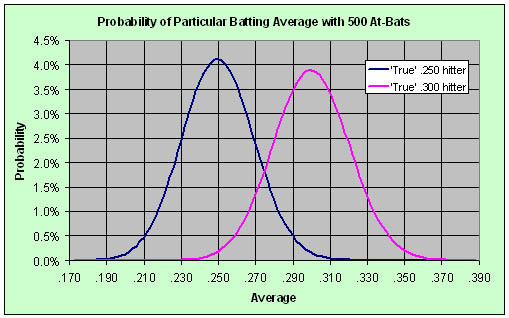 It’s interesting that even after 500 at-bats, almost a full season, the .250 hitter has about a 1-in-25 chance of equaling or bettering the .300 hitter. After about 900 at-bats, the chance falls to 1-in-100. Just goes to show how long the long run can be, statistically speaking.